Sherlock Mystery slot machine from Playtech is another title based on the legendary character from Sir Arthur Conan Doyle, Sherlock Holmes. Although the subject matter has been covered in other slots this version is actually very decent, with 5 reels, 20 paylines and a huge jackpot of 10,000x. As well as a big jackpot the game also benefits from a free spins bonus round rewarding players with 10 free spins and a multiplier up to 5x. The full details are in the Sherlock Mystery slot review below. Sherlock Holmes and Dr John Watson certainly need no introduction to fans of literature or film – but now the dynamic detective duo also get their own slot outing thanks to Playtech slots’ Sherlock Mystery slot. 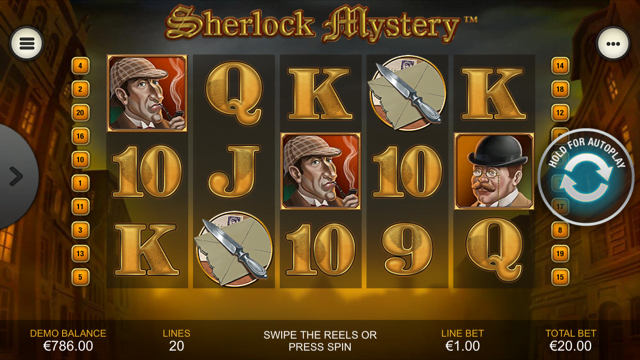 A five-reel, 20-payline game with an authentically Victorian feel, the Sherlock Mystery slot machine is loosely based around the series of novels by Sir Arthur Conan Doyle and features many iconic characters and locations on its gameboard. First and foremost, there are interpretations of both Holmes and Watson alike, with the iconic 221b Baker Street address also appearing as a feature-triggering scatter symbol. Playable from as little as £0.20 per spin across all desktop, mobile and tablet devices, Sherlock Mystery offers players a sizable 10,000x jackpot and a trio of features that also go some way to boosting their base game winnings. Cash prizes and free spins are both up for grabs, but the game’s most innovative bonus takes players to a crime scene where they can actually help Sherlock unravel another mystery. Triggered whenever players land magnifying glass symbols on reels one, three and five simultaneously, the Crime Scene Bonus feature will start automatically and players will be prompted to scan their surroundings to uncover cash prizes. By picking items of evidence, they’ll continually add further rewards to their total until the word “collect” is uncovered, with this returning them to the base game. The other main feature in the Sherlock Mystery slot is activated when at least three 221b Baker Street symbols appear anywhere on the reels. Whenever this happens, players will receive 10 bonus games that benefit from an additional gun wild symbol that can randomly boost their payline wins by 2x, 3x or 5x. What’s more, additional free spins and the Crime Scene Bonus can both be triggered from this feature. Rounding out the trio of incentives that feature in Sherlock Mystery, the game also includes an in-reel bonus that occurs whenever Holmes and Watson symbols appear adjacent to one another on the reels. When this happens, the two symbols will merge together and players will receive 3x their bet. Although perhaps lacking the polish of other Playtech titles, the Sherlock Mystery slot has enough going for it to tempt players into a few spins – especially when you consider the hefty base game jackpot on offer. Like the Sherlock Mystery slot review? Check out these as well…..